Fabreeka® QuietDown® is a multi-purpose, high performance acoustic underlay engineered to reduce sound transmission through subfloors. It is manufactured from durable recycled rubber, which translates into a stronger, more resilient acoustic underlay that won’t pack down or fall apart over time. Fabreeka QuietDown is perfect for condos, kitchens, playrooms, institutional settings and anywhere else where noise transmission is a concern. What type of floor covering can I use with Fabreeka® QuietDown®? 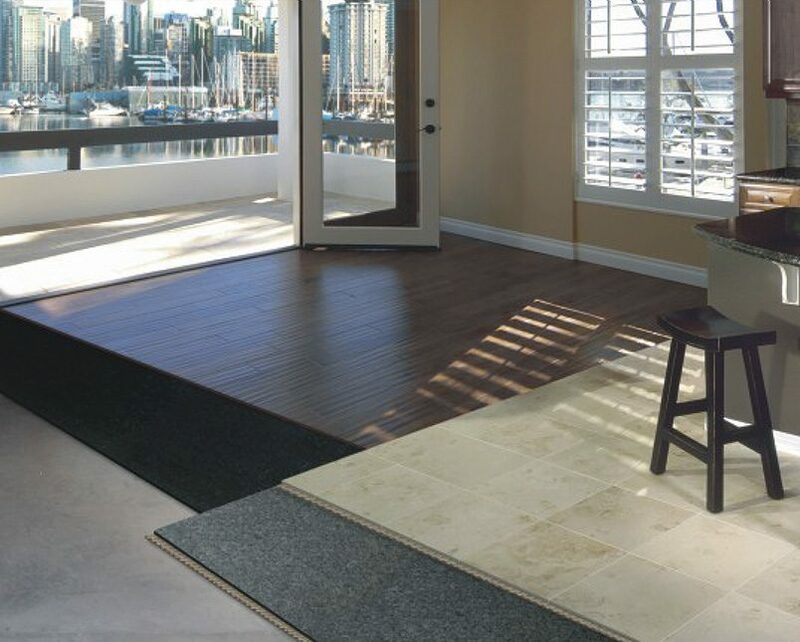 Laminate, engineered wood, solid hardwood, commercial carpet, ceramic tile, porcelain and stone. Does the smell of rubber go away? Yes it does. Fabreeka QuietDown is manufactured using recycled rubber, which has an odor of rubber. Left in the open, the smell will dissipate after a few days. Once covered by the floor covering the smell will no longer be detectable. Can I use Fabreeka QuietDown in my basement? Fabreeka QuietDown Max HB is 100% vapor proof, and we have had a number of customers install it in their basements. Fabreeka QuietDown Max HB will prevent moisture from traveling upwards into your floor covering, but if you have a wet basement issue, Fabreeka QuietDown Max HB will not solve your problem. It is recommended that you fix the root cause of the moisture, then install your floor coverings. What type of sound does Fabreeka QuietDown reduce? Mid to high frequency impact sounds, such as sliding chairs, moving furniture, people walking in hard soled shoes, children dropping toys, pots, pans or items being dropped in kitchens. I want to get rid of the sound of booming bass, will Fabreeka QuietDown work for this? No. Most acoustic underlay products will not get rid of low frequency sound transmission. In order to reduce low frequency sounds you need a combination of mass and structure, similar to the egg carton products you see in sound studios. This type of shape does not lend itself to underlay. Why does Fabreeka QuietDown come in sheets and not rolls? Homeowners and contractors have told us that rolls are heavy and cumbersome on a job site. Sheets are preferred for ease of installation. What do you recommend I use for adhesive? For tile/stone installations, use any brand name polymer modified thin set mortar that complies with TCNA (Tile Council of North America) specifications. For wood floor installations, use any brand name wood flooring urethane adhesive that complies with NWFA (National Wood Flooring Association) specifications. IIC, or Impact Insulation Class, is a unit of measure used in acoustics to measure the amount of impact sound transmission that passes through a subfloor. IIC ratings are dependent on entire assemblies, not a single element. Does the higher IIC number mean the product is better? Not necessarily. Unfortunately, a number of manufacturers claim that their products achieve extremely high IIC numbers. In order to determine the benefit of any underlayment, an IIC test must be done on the floor with and without the underlayment. The difference is the Delta IIC, which is what the underlayment contributes to the assembly. Laboratory and field tests of Fabreeka QuietDown have been conducted by independent organizations. Copies are available upon request. Can Fabreeka QuietDown be used on walls? Fabreeka QuietDown is tested and approved for use as an underlay below hard surface flooring. The product should be tested before use in other applications.